Last month, scientists and Bristol Bay residents testified before the Alaska House Resources Committee. 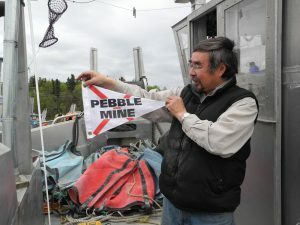 The group of fishermen and women, experts, and community leaders spoke about the importance of clean water, healthy salmon and abundant wildlife to the cultures and economies of the region. They said it in many ways, from many perspectives, but they all agreed that we should all be water protectors. Chief Tom Tilden in the documentary, “We Can’t Eat Gold.” Production still by Giovanna Marcantonio. Tom Tilden, chief of the Curyung Tribal Council and board member of Nunamta Aulukestai, spoke on behalf of Nunamta, a coalition of Alaska Native Village Corporations and tribes in the Bristol Bay region dedicated to protecting the Bristol Bay watershed from unsustainable development. Here’s an excerpt from his testimony, edited for written form. I am a fisherman and the son of Earl Tilden, who came to Alaska from San Jose as a gold prospector in 1932. Meanwhile, in the diary’s side notes, my father wrote about how he caught some beaver, he caught some mink, he got some other fur animals that he had to skin out and clean. Then the diary goes silent between April and August, when it starts up again. I am a subsistence and a commercial fisherman. That is all I do for a living. I have fished commercially since 1965. I have been a setnetter for salmon, a gillnetter for salmon and herring, a seiner for herring, and a longliner for halibut. 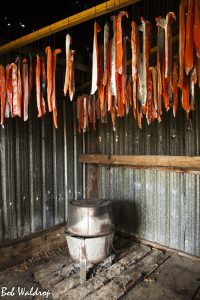 Before my commercial fishing, I make sure I that I have smoked, salted, frozen fish put away for the winter. And I do this before I go commercially fishing, just like many of the folks in Bristol Bay do. I grew up on the Nushagak River, in the village of Portage Creek. Our family lived a subsistence lifestyle. We depended on natural resources to survive. We took from the river salmon, white fish, pike, trout and smelts. All year round or seasonally if you’re migrating through. We took muskrat and beavers that swam in the rivers. We depended on other food sources through the winter, such as rabbits and caribou and moose and porcupine. We depended on greens and berries from the land. The air provided us with ptarmigan, geese and ducks. All of these are abundant along the rivers—and they all depend on clean water. Living a subsistence lifestyle is a full time job. You do it 7 days a week, 365 days a year. There is no break. Our priests bless our river system every year on Jan. 19. The water is blessed for all who partake in it. We collect that water in containers and use it throughout the year to bless our nets, our boats, our homes, our steams, and to bless us when we are sick. Water is sacred in our lives. 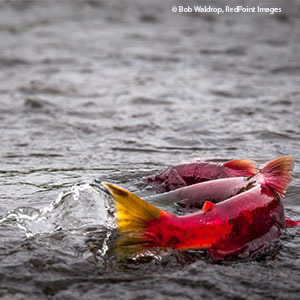 Our rivers need your protection, as all rivers in Alaska need your protection. Article VIII of our Alaska Constitution says that the resources belong to all of us. Protect it for all of us.